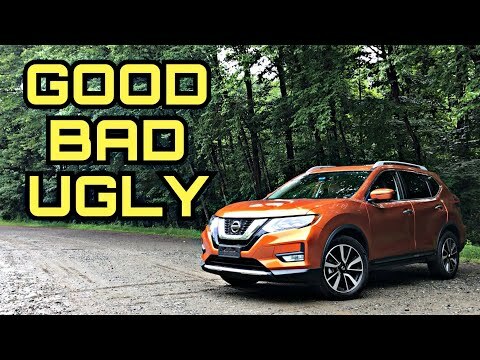 A comfortable and fuel-efficient compact SUV, the perennially popular 2018 Nissan Rogue is the brand's best-selling model and it's one of just a few compact SUVs available as a hybrid. Offered in three trim levels, Rogue prices start just over $25,000, which is competitive for the segment that includes class-leading small SUVs, the Honda CR-V and Toyota RAV4 as well as the Mazda CX-5 and Ford Escape. Feeling fun and fancy in my Rogue. In searching for a new vehicle I kept coming back to the Nissan Rogue. It is outside appearance is very sleek and although it is not classified as a luxury vehicle the interior is nothing shy of sophisticated. The leather seats have been easy to take care of and the heated front seats leave you feeling nice and toasty. I really like the memory seat to program just the way I prefer my seat when driving. Even though it seats five, three adults would probably not fit comfortable in the back seat. In the Texas heat air is a must. The Rogue comes with dual air conditioning and rear vents to help keep the whole car cool. With my active family and sports equipment it was important to have plenty of cargo space to lug everything around. Plenty of space for groceries, luggage, and the adjustable shelves make it easy to make the perfect fit for anything. The Rogue’s gas mileage does not disappoint on daily drives and longer road trips. I have been averaging between 27-32 mpg. I have enjoyed the moonroof on these fall days and starry nights. My teenagers never complain about the entertainment system and able to keep their phones charged. Many features include automatic headlights, front and back windshield wipers at adjustable speeds, front and back defrost, rear backup camera allows additional safety measures, alerts you when someone is in your blind spot with a warning light located driver and passenger sides, airbags, navigation system, Bluetooth that allows hands free phone availability. There is some road noise and occasionally not the smoothest of rides. Overall I love my new Rogue! Great driving experience. Electronic s not user friendly. My review is lacking a star due to the electronic aspect of the car. My car does not always pair back up to my. Phone or will disconnect from my phone while in use. The Nissanconnect app is not straight forward or easy to use. My husband had to call the dealership so that we would be permitted access to even connect the app to the car. The navigational system is not the most up to date even though we just got the vehicle. The voice command never knows what I am saying no matter how slow or how clear I pronounce a word or name. Other then the electronic aspect I love the car. I love the safety features. The cruise control works great and I love how it breaks for me if someone cuts me off. The car's reaction time is much quicker than mine. I feel safe when I drive the vehicle. Things I love about my 2018 rouge. I love my stereo, steering wheel, it tilts, and pulls out more and pushes in. I like the passenger assist. The light up marks on mirrors help see cars in blind spots, because there are 6 new spots 1 3 pair on each side that are new blind spots, due to car looking more area dynamic, or its because I a m just short, lol. Cup holders in right spot. They should have 2 different sunglass holders. The subversion on passenger side causes a blind spot, with a reflection. I still love my rouge. I have been getting a rouge every other 2 years since 2011. I love the eco button, its comfortable and fits shape of body. And the seat warmers are good. This winter will be the first winter with the auto start and wheel warmer. I am definitely looking forward to that.